I consider myself very blessed to live on this farm. Among my most favorite aspects of this agrarian life are the daily gifts of farm fresh eggs. 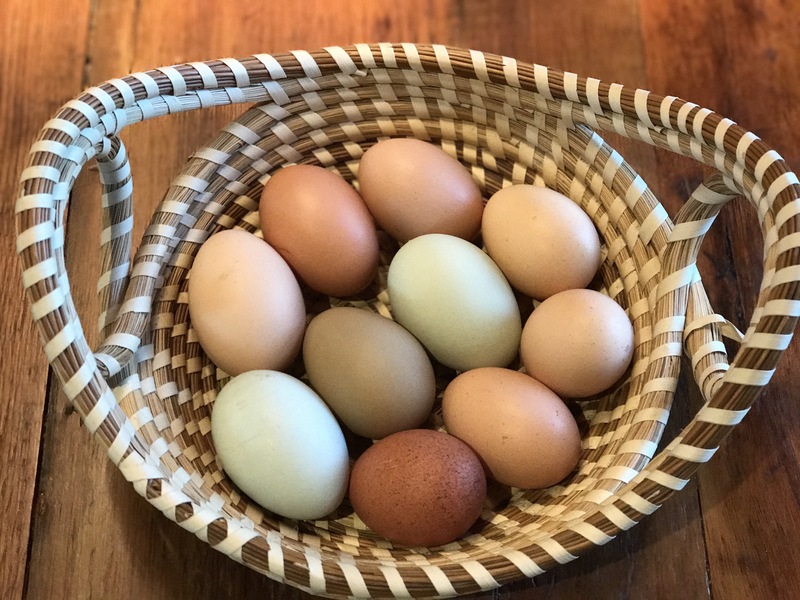 Our flock consists of six guinea hens, one rooster, and thirteen egg laying hens (this number is often fluctuating, depending on our success with keeping the foxes at bay and whether the hens get broody and start hatching babies). These girls are pasture-raised, which is a step above free range or cage-free hens. 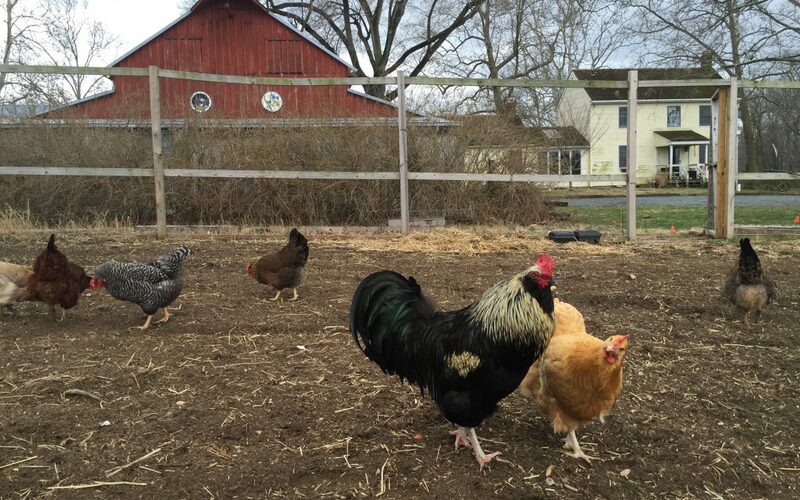 Technically, if we never let our hens out beyond our 14’x10’ chicken coop, they would be free range or cage-free birds (which is so much better than the conditions of the factory farm CAFOs [concentrated animal feeding operations] that dominate the Eastern Shore chicken industry). Our sweet ladies, however, enjoy the life of total freedom. As pasture-raised animals, they are allowed to roam over the entirety of our 34-acre farm each day and are secured in their coop only at night to protect them from predators. It is quite a site to see how they self-protect by going back “home” to roost as the sun goes down each night. In addition to their delightful eggs, they help us keep our insect population – especially ticks – under better control and love to assist with the composting of our food scraps. In full disclosure, I find it challenging to share recipes since I rarely use them when cooking. Rather, I like to let the food and ingredients speak to me and treat the entire exercise as an artistic endeavor. I never measure – a pinch of this, a dash of that; eyeball how many vegetables to chop. So apologies in advance if you find my version of the “recipe” hard to follow. Begin by warming a skillet with olive oil and add ½ to ¼ inch thick cut round slices of premade polenta cakes to fry on each side (I like to do 4-5 cakes per serving; browned to desired crispiness. I like mine golden crispy!). In another skillet, add a generous helping of halved cherry tomatoes to olive oil, ground pepper, and salt. Heat the tomato mixture on a high flame until juicy and slightly caramelized. Remove the polenta cakes and put them on a plate (add shredded Gruyere cheese if you’re feeling naughty) and place tomatoes on the cakes. Fry eggs to desired cooking level (I love mine over easy; two eggs per serving) and place on top of tomatoes. Use the reduction sauce to drizzle over the top of the fried eggs. Preheat oven to 375 degrees. In a large iron skillet, drizzle olive oil and a bed of tortilla chips to cover the entire pan. Over the top of the chips, sprinkle your favorite ingredients to make this breakfast version of nachos. I like to add sautéed bell peppers, black beans, spicy organic chicken sausage, tomatoes, and shredded cheese. Of these ingredients, I cook the bell peppers and the chicken sausage separately before I place them on the tortilla chips. In a separate bowl, whisk your eggs together (add milk if you are a dairy person; I am not). You want to use enough eggs to be able to completely cover the dish. For a large skillet, it will likely be 8-12 eggs. Once you have added the eggs to the dish, place in the oven for about 15-20 minutes, checking regularly for when the egg moves from liquid to firm. Finish the dish with some extra cheese on top, under the broiler to make it golden brown. Serve with garnishings of avocado or guacamole, salsa and/or hot sauce, and sour cream or yogurt. I begin this dish by first preparing the stewed fruit toping. We have an Asian pear orchard at the farm but you can also use apples. Slice one apple/pear per person into a pot and cover with water. Add pumpkin pie spice and a tablespoon of maple syrup. Cook on medium flame until bringing to a boil and then simmer. For the pancakes, I use Bob’s Red Mill grains and like the buckwheat, multi-grain, or buttermilk varieties. I mostly follow the directions on the package – one serving (which makes about 4 pancakes) is a cup of grains, one egg, and ¾ cup milk (I use almond). I replace the tablespoon of oil with honey (it’s a more whole food with more nutritional value and gives it a slightly sweeter taste). I also like to add fresh blueberries. I usually place olive oil in my skillet and turn it on to get warm while I’m mixing ingredients so I have a good, solid pancake from the get-go (they always cook better in a warm skillet). To the finished pancakes, I add butter, stewed fruit, and organic Grade B maple syrup (please don’t ruin your pancakes with those high fructose corn syrup fakers). When I’m able to find it, there is nothing better than some cherry butter to spread on your pancakes as well! Preheat oven to 375 degrees. Dice an array of your favorite vegetables for this initial step. I like to use bell peppers, yellow squash, zucchini, tomatoes, and finely chopped bits of broccoli. In a skillet with some olive oil, salt, and pepper, sauté the peppers and squash and add in the broccoli bits towards the end. In a separate bowl, whisk your eggs together (add milk if you a dairy person; I am not). You want to use enough eggs to be able to completely cover the dish. For a large skillet, it will likely be 8-12 eggs. Once you have added the eggs to the dish, cook on the stove top first for about 5-10 minutes on a medium flame. Add tomatoes (and cheese if you would like) to the top and then place the skillet in the oven for about 15-20 minutes, checking regularly for when the egg moves from liquid to firm. Finish the dish under the broiler to make it golden brown. I often serve this dish with a skillet of homemade hashed brown potatoes and a side of toast with avocado. And of course, hot sauce. Everything at my house gets hot sauce. This dish is easy but no less delicious. In a skillet with olive oil, add a generous helping of halved cherry tomatoes with ground pepper and salt. Heat the tomato mixture on a high flame until juicy and slightly caramelized. In a separate bowl, whisk together eggs (two per person) and your favorite hot sauce (add a little milk to make them fluffy if you like dairy). Add this mixture to your tomatoes and scramble until cooked. Serve with your favorite toast, drizzled in olive oil and with mashed avocado on top. Salt and pepper avocado toast to taste.